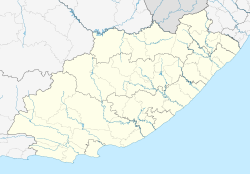 For other places with the same name, see Port Elizabeth (disambiguation). Hunters and gatherers ancestral to the San first settled the area around what is now called Algoa Bay at least 10,000 years ago. Around 2,000 years ago, they were gradually displaced or assimilated by agriculturalist populations ancestral to the Xhosa people, who migrated into the region from the north. The first Europeans to visit the area sailed with the Portuguese explorers Bartholomeu Dias, who landed on St Croix Island in Algoa Bay in 1488, and Vasco da Gama, who noted the nearby Bird Island in 1497. For centuries, the area appeared on European navigation charts marked simply as "a landing place with fresh water". The Portuguese Crown had as one of its main goals in the Indian Ocean taking over the lucrative trade of Arab and Afro-Arabian merchants who plied routes between the East African coast and India. As they took over that trade, the Portuguese strengthened trading with Goa, their main trading point in India. The name Algoa means "to Goa", just as the port further north in present-day Mozambique, Delagoa means "from Goa" in Portuguese. The area became part of the Cape Colony. This area had a turbulent history between the settlement by the Dutch East India Company in 1652 and the formation of the Union of South Africa in 1910. In 1799, at the time of the first British occupation of the Colony during the Napoleonic Wars, British troops built a stone fort named Fort Frederick after the Duke of York. 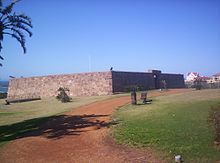 This fort, aiming to deter a possible landing of French troops, overlooked the site of what later became Port Elizabeth. The fort is now preserved as a monument. From 1814 to 1821 the Strandfontein farm, which later became the Summerstrand beach suburb of Port Elizabeth, was owned by Piet Retief. He later became a Voortrekker leader and was killed in 1837 by Zulu king Dingane during negotiations about land. An estimated 500 men, woman and children of his party were massacred. Frederik Korsten owned the Strandfontein farm after Retief. The suburb of Korsten was named after Frederick since the 19th Century. In 1820 a party of 4,000 British settlers arrived by sea, encouraged by the government of the Cape Colony to form a settlement to strengthen the border region between the Cape Colony and the Xhosa people. At this time the seaport town was founded by Sir Rufane Shaw Donkin, the Acting Governor of the Cape Colony (in office: 1820-1821), who named it "Port Elizabeth" after his late wife, Elizabeth, Diplomat Edmund Roberts visited Port Elizabeth in the early 1830s. Roberts noted that Port Elizabeth in the 1820s had "contained four houses, and now it has upward of one hundred houses, and its residents are rated at above twelve hundred persons". The Roman Catholic Church established the Apostolic Vicariate of Cape of Good Hope, Eastern District in the city in 1847, and in 1861 Port Elizabeth was granted the status of autonomous municipality. The population increased rapidly after 1873 when the railway to Kimberley was built. Cape Colony Prime Minister John Molteno had formed the Cape Government Railways in 1872, and the massive expansion of the Cape Colony's railway network over the following years saw the harbour of Port Elizabeth servicing a large area of the Cape's hinterland. The rapid economic development around the port, which followed the railway construction, caused Port Elizabeth to get the nickname "the Liverpool of South Africa". The town expanded as a diverse community comprising Xhosa as well as European, Cape Malay and other immigrants. During the Second Boer War of 1899-1902 the port served as an important transit-point for British soldiers, horses and materials headed to the front by railway. While no armed conflict took place within the city, many refugees from the war moved into the city. These included Boer women and children, whom the British interned in a concentration camp. "The unveiling of the monument commemorating the services of the horses which perished during the Anglo Boer War, 1899-1902, took place on Saturday afternoon, February 11, 1905, with His Worship the Mayor, Mr A Fettes, performing the ceremony." Under apartheid, the South African government established legal racial segregation and started programs to separate communities physically as well as by classification and custom. The forced relocation under the auspices of the Group Areas Act of the non-white population from mixed areas began in 1962, causing various townships to be built for their use. Classification was sometimes arbitrary, and as in many other localities throughout the country, many citizens appearing to have mixed ancestry were at times subject to re-classification, which often had intrusive sociopolitical results. The non-white tenants of South End, and land owners in Fairview were forcibly relocated from 1965 through to 1975, as these areas were valued as prime real estate. The city-planning was viewed as the prototypical apartheid city. As black South Africans organized to try to achieve civil rights and social justice, government repression increased. In 1977 Steve Biko, the black anti-apartheid activist, was interrogated and tortured by the security police in Port Elizabeth before being transported to Pretoria, where he died. Other notable deaths in the city during this time included those of The Cradock Four, and of George Botha, a high-school teacher. In 1952 the African National Congress and the South African Indian Congress (SAIC) called all South Africans to stand up against the apartheid government's unjust laws directed at the black African, Indian and coloured population. On April 6, while most white South Africans celebrated the tercentenary of Jan van Riebeeck's arrival at the Cape in 1652, the ANC and SAIC called on black South Africans to observe the day as a "A National Day of Pledge and Prayer". 15 000 people attended in Johannesburg, 10 000 in Cape Town, 10 000 in Durban and 20 000 in Port Elizabeth. The meeting in Port Elizabeth was led by Professor Z. K. Matthews and by Raymond Mhlaba. "I led the very first group and we entered the 'Europeans Only' section of the New Brighton station. By half past six we were already in police vans on our way to jail. It turned out that my party (group) was the very first to defy unjust laws in the whole of South Africa. Little did we know that we were making history." Mhlaba became the first man to be arrested during the campaign, while Francis Matomela was the first woman. 2 007 people were arrested in Port Elizabeth during the Defiance Campaign included Oom Gov (Govan Mbeki) and Vuyisile Mini. Other volunteers who emerged as key role players during the campaign included Nosipho Dastile, Nontuthuzelo Mabala, Lillian Diedricks and Veronica Sobukwe. After the formation of the ANC-affiliated United Democratic Front in 1983, political consciousness in black townships grew. With numerous protests across the country and the massacre in Langa township near Uitenhage, Eastern Cape police presence had increased in South African townships. In Port Elizabeth townships, black South Africans demanded the integration of public institutions, the removal of troops from black townships, and the end of workplace discrimination. To launch an effective campaign to cripple the white-owned institutions of Port Elizabeth and to undermine the legitimacy of apartheid, several women suggested the idea of a consumer boycott to the Port Elizabeth Black Civic Organisation (PEBCO) in May 1985. The economic boycott began on July 15, 1985, and received massive support in townships around Port Elizabeth. By September 1985, white business-owners became desperate and called on the government to meet the demands of black South Africans. In November the boycott was still hurting white businesses in Port Elizabeth greatly. The white South African government reached an agreement with PEBCO which stated that the boycott would halt until March 1986 if business owners arranged for the release of black leaders. In 1986, as the deal was approaching its end, the boycotters imposed a deadline of March 31, stating that the boycott would resume if the initial demands were not met. On March 11, the government unexpectedly banned two leaders, one of whom was Mkuseli Jack. However, on March 22, the ban was lifted by the decision of a Supreme Court Justice on the grounds that the government had given insufficient reasons. Jack ripped up the ban papers, and used the celebration as a way to represent the solidarity that the campaign required. As the demands of the boycotters were not met by March 31, the boycott was renewed on April 1. The boycott continued for nine weeks, but on June 12, 1986, another state of emergency was imposed by the National Party government. Security forces searched through the townships, arresting thousands and raiding the offices of black civics, trade unions, the UDF, the South African Council, and churches and also confiscating documents. With the establishment of the Coega Industrial Development Zone (CIDZ), foreign direct and also national-level investment has improved substantially in the region of Nelson Mandela Bay/Port Elizabeth. The IDZ, under the stewardship of the Coega Development Corporation (CDC), since inception has managed to attract to its investment account in excess of R140-billion into the economy of the Eastern Cape and has enabled the creation of over 45 000 jobs. This is significant for the sustainability of the IDZ, Nelson Mandela Bay, and the economy of the Eastern Cape. The CDC consistently continues to demonstrate its capability as the leading catalyst for socio-economic growth in the Eastern Cape, with a view to becoming so for South Africa. 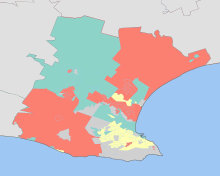 In 2001 the Nelson Mandela Bay Metropolitan Municipality formed as an administrative area covering Port Elizabeth, the neighbouring towns of Uitenhage and Despatch and the surrounding agricultural areas. The name honours former President Nelson Mandela. The combined metropolitan area had a population estimated at around 1.3 million in 2006. Overtaking its next door neighbouring city East London, Port Elizabeth became the host. The Nelson Mandela Bay Stadium hosted eight World Cup games, featuring South Korea, Greece; Ivory Coast, Portugal; Germany, Serbia; Chile, Switzerland; Slovenia, England in the First Stage, then Uruguay, South Korea in the Group of 16. A quarter-final between Netherlands, Brazil was hosted, then for the Third Place playoff, Uruguay, Germany were hosted at the stadium. The World Cup was played between 11 June 2010 and 10 July 2010. Spain were the eventual champions. Under the Köppen climate classification, Port Elizabeth has an oceanic climate (Cfb ). The area lies between the winter rainfall, Mediterranean climate zones of the Western Cape and the summer rainfall regions of eastern South Africa. Winters are cool but mild and summers are warm but considerably less humid and hot than more northerly parts of South Africa's east coast. The climate is very even throughout the year with extreme heat or moderate cold rare. Port Elizabeth has numerous water features in its encompassing area. There is a vast length of marine coastline on the city's outer encroachments particularly southwards. Beaches like Kings Beach, Hobie Beach, Bluewater Bay, Sardinia Bay, and the beaches along Marine Drive are abundant. Kings Beach is adjacent to Port Elizabeth's harbour, and the longshore drift from Cape Recife provides a plentiful supply of sea sand. On the north westerly coastline of Port Elizabeth,the contours tends to be rockier than the area between Cape Recife, and the Port of Ngqura. Port Elizabeth has a few rivers, of which the Baakens River is the most prominent. This river usually floods when a reasonable amount precipitation is observed, especially at low level crossings. North End Lake is the largest natural freshwater body in Port Elizabeth, but has experienced a form of contamination from industry. (It is not recommended to ingest anything from this lake) Also, numerous smaller "lakes" are in the surrounding area, namely Lake Farm. Port Elizabeth (as a whole, the entire Eastern Cape) is experiencing a devastating drought, of which a disaster has been declared by the current office bearers of the greater municipality. Water restrictions are in place, and measures are in place to provide enough water in the near future, namely freshwater treatment works being constructed to acquire additional water from the Gariep Dam. Historically, the majority of trade in the region came through Port Elizabeth. In the 1830s, at least five ships regularly transported goods to Europe. It became a free port in 1832. In 1833, about 50 vessels had moved through the port. In 1828, 55,201 pounds, (25038 kg), of goods were imported through the port, increasing by 1832 to 112,845 pounds, (51185 kg), imported in that year. Port Elizabeth exported 41,290 pounds, (18738 kg), in 1828, with a large increase to 86,931 pounds, (39431 kg), goods exported in 1829. Exports included wine, brandy, vinegar, ivory, hides and skins, leather, tallow, butter, soap, wool, ostrich feathers, salted beef, wheat, candles, aloe, barley, and more. Home of South Africa's motor vehicle industry, Port Elizabeth boasts most vehicle assembly plants, General Motors, Ford, Volkswagen, Continental Tyres and many other automotive-related companies. As of 2018, after GM's exit from Port Elizabeth and South Africa, Isuzu took over their production plant in Struandale. FAW also have built a multi-billion rand plant in the region. Most other industries in Port Elizabeth are geared towards the motor vehicle industry, providing parts such as wiring harnesses, catalytic converters, batteries and tyres to the vehicle manufacturers. Port Elizabeth is also a major seaport, with the most significant ore loading facilities in the southern hemisphere. As part of the ongoing development, a new Industrial Development Zone with expanded port facilities has been built at Coega. The Donkin Reserve in Port Elizabeth, taken in September 2014. It portrays both the older and parts of the newer sections of the monument. Located at the end of the picturesque Garden Route along the Cape coast, the city has beaches in and near it. The most popular swimming beaches include King's Beach and Hobie Beach. Many local historic attractions are linked by the Donkin Heritage Trail. These include the Campanile (bell tower), built in 1923 to commemorate the arrival of the 1820 Settlers and offering a viewpoint over the city; the city hall (1862); the Donkin Reserve park and monument; and the old stone Fort Frederick itself (1799). The CBD also boasts the towering Eastern Cape post office headquarters. Route 67 is a walking trail consisting of 67 public artworks, symbolising 67 years which Nelson Mandela dedicated to the freedom of South Africa. 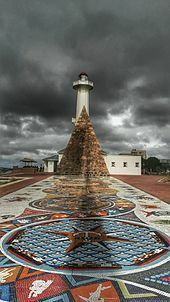 The artwork is a celebration of South African culture and history and is scattered along the route as it starts from the Campanile, up the stairs to the Vuysile Mini Market Square and to the large South African flag at the Donkin Reserve. The artworks were created by local Eastern Cape artists. Other attractions include the gardens at St George's Park, the Nelson Mandela Metropolitan Art Museum (formerly known as the King George VI Art Gallery), the museum and oceanography room at Humewood, and the new Boardwalk waterfront complex. The wider area surrounding PE also features game viewing opportunities, including the Addo Elephant National Park, 72 kilometres (45 mi) to the north near the Zuurberg mountain range. Port Elizabeth is also a destination for whale watching with humpback whales sighted between June and August, and again between November and January, southern right whales sighted between July and November, and Bryde's whales sighted all year round. The biggest sporting events in Port Elizabeth, is the annual Ironman triathlon and the Herald Cycle tour. The Tuna classic deep-sea fishing competition attracts anglers from all over the world. The city has facilities catering for cricket, rugby union, athletics, association football, field hockey and many other sports. Its coastal location also makes it a base for many watersports. Port Elizabeth is the location of the St George's Park cricket ground, which holds test cricket matches. St George's Park is the oldest cricket ground in South Africa, and was the venue for the first Test match played outside of Australia or England, between South Africa and England on 12 and 13 March 1889. The Warriors, a franchise cricket team in South Africa, is based in Port Elizabeth. The stadium is also known for its band that entertains fans at the Proteas games. The headquarters of the Southern Spears rugby franchise was in Port Elizabeth. The long-standing Eastern Province Rugby Union, now commonly known as the Eastern Province Elephants, formed the basis of the Spears franchise together with East London's Border Bulldogs. The remnants of the Spears were later reconstituted into the Southern Kings, also based in Port Elizabeth, which joined Super Rugby in 2013. The Southern Kings did not participate in Super Rugby in 2014 or 2015, and returned to Super Rugby in 2016, 2017, but were dropped for economical reasons by SARU. The team now competes in the Guinness Pro14. The Eastern Province Rugby Union play their home matches at Nelson Mandela Bay Stadium, built for the 2010 FIFA World Cup. In December 2011, Nelson Mandela Bay Stadium became the new home of the South Africa Sevens, the country's leg of the annual IRB Sevens World Series in rugby sevens. The event had previously been held in three other cities, most recently in George in the Western Cape from 2002 to 2010. As of 2015, is hosted annually in Cape Town, in the Western Cape. The city's main football club is Chippa United, they currently use the Nelson Mandela Bay Stadium as their home ground. Previous clubs to play in the country's top tier were Bay United, Michau Warriors, Port Elizabeth Blackpool, Hotspur F.C., Port Elizabeth City and Westview Apollon. The Algoa Bay Yacht Club operates out of the Port of Port Elizabeth. Port Elizabeth had its own municipality from 1843 to 2000. Since then, it has formed part of the Nelson Mandela Bay Metropolitan Municipality, and serves as the seat for the surrounding Cacadu District Municipality. It has a Magistrate's Court, a local seat of the Eastern Cape Division of the High Court, and a branch of the Labour Court. As a result of the presence of a High Court, several other related organs of state such as a Masters Office and a Director of Public Prosecutions are present in the city. All Government (mostly provincial) departments maintain branches or other offices in Port Elizabeth. The Port Elizabeth municipality assumed a coat of arms on 9 January 1878. The design, prepared by Bradbury Wilkinson and Company (of London), was a simplified version of the arms of Sir Rufane Donkin : Gules, on a chevron Argent between two cinquefoils in chief and a bugle horn stringed in base Or, three buckles Sable; a chief embattled Argent thereon an elephant statant proper. The crest was a sailing ship, and the motto In meliora spera. Eighty years later, in 1958, the council made slight changes to the arms, and had them granted by the College of Arms. The changes consisted of adding two anchors to the chief of the shield, placing a red mural crown bearing three golden rings below the ship in the crest, and changing the motto to Tu meliora spera. The arms were registered with the Cape Provincial Administration in 1959, and at the Bureau of Heraldry in 1986. The Nelson Mandela University was formed by the amalgamation of the University of Port Elizabeth, Port Elizabeth Technikon, and the Port Elizabeth campus of Vista University. It is the largest university in the Eastern and Southern Cape, with around 24,000 students in seven faculties spread over seven campuses. Russell Road College and AFDA also have campuses in Port Elizabeth. The city has a number of top government-funded and private schools, although the abuse of substances seems to prevail in some schools due to a lack of drug prevention training on the part of the educational system, including Alexander Road High School, Collegiate Girls' High School, Victoria Park High School, Grey High School, Pearson High School, Woodridge College, Andrew Rabie High School and Lawson Brown High School. Port Elizabeth lies on the N2 road. To the west the road travels the Garden Route to George and Cape Town; to the east, the road runs through the Border Country through Grahamstown, to East London then on to Durban, terminating in Ermelo in Mpumalanga. The R75 connects Port Elizabeth to the Karoo. The major routes within the city are numbered as metropolitan or M routes. The city's main bus station is in Market Square. The public bus service is run by the Algoa Bus Company. Between 1881 and 1948, there was a Port Elizabeth tramway network, powered initially by horses, and later by electricity. Port Elizabeth railway station is served by South Africa's rail network. Local commuter services are operated by Metrorail, while the Shosholoza Meyl long-distance passenger service links PE with Johannesburg via Bloemfontein where it is possible to connect with other long-distance routes. The Apple Express narrow-gauge tourist train to Avontuur operated from the separate station in Humewood Road near King's Beach. It departed regularly for Thornhill Village via Van Stadens River bridge, the highest narrow-gauge rail bridge in the world. The Apple Express was launched to provide a service to transport fresh produce and wood from the farms along the line to Avontuur. The line was completed in 1914 and the train delivered produce directly from the farms to ships in the Port Elizabeth Harbour. Due to modern transport methods such as containerisation, and refrigerated containers and trucks, the Apple Express and its services became redundant. Service has now ceased. In preparation for the 2010 World Cup Soccer event the Humerail Station was extensively upgraded. Several disused narrow gauge goods wagons were scrapped and removed from the site, several buildings in the area have also been renovated and revamped. Port Elizabeth Airport (IATA airport code PLZ, ICAO airport code FAPE) serves the city for both passenger and cargo traffic. It is the fourth busiest airport in South Africa after Johannesburg International Airport, King Shaka International Airport in Durban, and Cape Town International Airport. International visitors to the city must currently fly to either Johannesburg, Cape Town or Durban, and then take a domestic flight to Port Elizabeth. An upgrade to the terminal building, completed in 2004, created the necessary facilities to handle international flights although none are scheduled as yet. Port Elizabeth has a harbour in Algoa Bay, and the construction of an additional international harbour at Coega has supported an increase in the size of the city's industries and the addition of new industries. The Herald serves the English populace in terms of newspaper, on a daily basis. Die Burger serves the Afrikaans communities as well with a well established readership base. There are various social media news groups in Port Elizabeth, which is used at most as neighbourhood watch groups. The SABC has a regional office in Port Elizabeth. ^ a b c d e "Main Place Port Elizabeth". Census 2011. ^ Pettman, Charles (1913). Africanderisms; a glossary of South African colloquial words and phrases and of place and other names. Longmans, Green and Co. p. 51. ^ "The San". SA History. Retrieved 2018-03-19. Chisholm, Hugh, ed. (1911). "Algoa Bay" . Encyclopædia Britannica. 1 (11th ed.). Cambridge University Press. p. 655. ^ "Nelson Mandela Bay Tourism – Historical information". Nelson Mandela Bay Tourism. ^ "Google". Google Translate. Retrieved 2018-03-19. ^ "Unit 2. Colonialism and Segregation: The Origins of Apartheid". South Africa: Overcoming Apartheid, Building Democracy. Retrieved 2018-03-19. ^ "Fort Frederick". Nelson Mandela Bay Tourism. Retrieved 2018-03-19. ^ "Port Elizabeth of Yore: Piet Retief as Land Speculator". The Casual Observer. Retrieved 2018-03-19. ^ "Colonial History of Port Elizabeth". SA History. Retrieved 2018-03-19. ^ "The Port Elizabeth Pyramid". Internet Archive. Retrieved 2018-03-19. ^ a b c Roberts, Edmund (1837). Embassy to the Eastern Courts of Cochin-China, Siam, and Muscat. New York: Harper & Brothers. p. 388. ^ "Info Please article". Info Please. 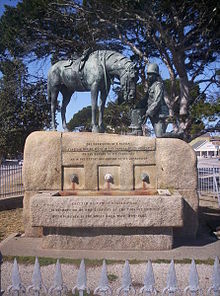 ^ "The Horse Memorial". St George's Park. Retrieved 2018-03-19. ^ > "History Of South End". South End Museum. Retrieved 2018-03-19. ^ "Biography of Steve Biko". about.com African History. ^ "The Cradock Four". The Cradock Four. Retrieved 2018-03-19. ^ "George Botha jumped a railing..." SA History. Retrieved 2018-03-19. ^ Mhlaba, Raymond; Mufamadi, Thembeka (2001). "Vulindlela (opening the way)". Raymond Mhlaba's Personal Memoirs: Reminiscing from Rwanda and Uganda. Robben Island memory series. Pretoria: Human Sciences Research Council and Robben Island Museum. p. 84. ISBN 9780796919748. Retrieved 2018-02-21. I led the very first group and we entered the 'Europeans Only' section of the New Brighton station. By half past six we were already in police vans on our way to jail. It turned out that my party was the very first to defy unjust laws in the whole of South Africa. Little did we know that we were making history. ^ "Raymond Mhlaba Biography - Began as a Trade Unionist, Sentenced to Life Imprisonment, Continued the Struggle from Prison". Jrank. Retrieved 2018-03-19. ^ "Oom Ray and The Power of Mass Action". South African History Online. Retrieved 27 November 2017. ^ "South African blacks boycott apartheid in Port Elizabeth, 1985-86". Global Non-Violent Action Database. Retrieved 27 November 2017. ^ "Matches". FIFA. Retrieved 2018-03-20. ^ a b "Climate data for Port Elizabeth". South African Weather Service. June 2011. Archived from the original on 4 March 2012. Retrieved 6 March 2010. ^ "Port Elizabeth Climate Normals 1961−1990". National Oceanic and Atmospheric Administration. Retrieved March 16, 2015. ^ "Klimatafel von Port Elizabeth (Flugh. ), Prov. Eastern Cape / Südafrika" (PDF). Baseline climate means (1961-1990) from stations all over the world (in German). Deutscher Wetterdienst. Retrieved February 7, 2016. ^ "Freshwater". National Geographic. Retrieved 2018-03-20. ^ "Types of Drinking Water Contaminants". United States Environmental Protection Agency. Retrieved 2018-03-20. ^ , Census 2001 – Main Place "Port Elizabeth"
^ Roberts, Edmund (1837). Embassy to the Eastern Courts of Cochin-China, Siam, and Muscat. New York: Harper & Brothers. p. 391. ^ "67 Steps to take in Port Elizabeth". Umoya Cottages in Port Elizabeth. ^ "Cocaine scandal rocks top school". Herald Live. Retrieved 2018-03-19. ^ "Top school in drug scandal". News24. Retrieved 2018-03-20. ^ "'Cocaine teacher' found guilty". The New Age. Retrieved 2018-03-20. ^ "Drugs among biggest problems facing PE schools". News24. Retrieved 2018-03-20. ^ "Substance Abuse Education for Teachers". Substance Abuse. Retrieved 2018-03-19. ^ "The 100 best high schools in Africa, 2003." Archived 14 January 2007 at the Wayback Machine Africa Almanac. Retrieved 21 November 2009. ^ "Introduction and History of Port Elizabeth Airport". Airports Company of South Africa. Archived from the original on 23 September 2007. ^ "Radio Stations in Port Elizabeth". World Radio Map. Retrieved 2018-03-20. ^ "AlgoaFM". AlgoaFM. Retrieved 2018-03-20. ^ "Herald Live". Herald Live. Retrieved 2018-03-20. ^ "SABC". South African Broadcasting Corporation. Retrieved 2018-03-20. 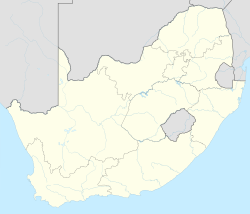 Wikimedia Commons has media related to Port Elizabeth. Wikivoyage has a travel guide for Port Elizabeth. Wikisource has the text of the 1911 Encyclopædia Britannica article Port Elizabeth.